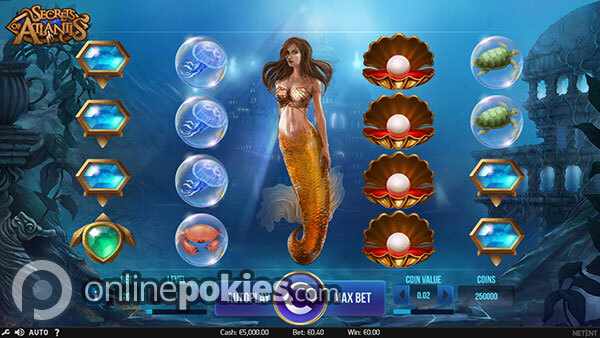 Secrets of Atlantis is a 20 line Net Ent pokie with a theme based on on the lost undersea world of Atlantis. 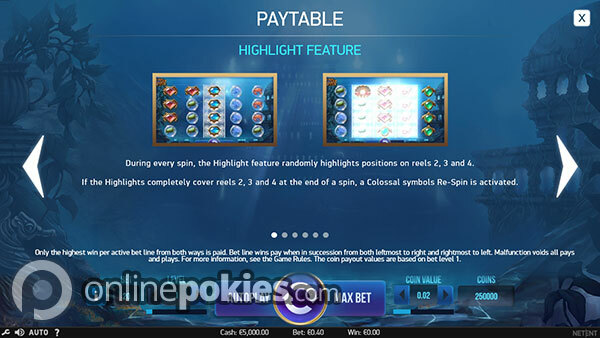 The game features a Colossal Re-Spin feature as well as nudge wilds and a 320,000 credit jackpot. Atlantis is a legendary lost island which has featured in many stories throughout the ages. Legend has it that Atlantis holds many secrets including the key to riches and world peace. 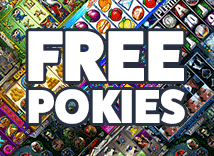 While the city has never been found you can now visit with the Secrets of Atlantis pokie from Net Ent. With 40 lines you have a minimum bet of 20c for all lines at the lowest coin size. You can bet up to 10 credits per line and have the option of selecting credit sizes ranging from 1 cent to $1. Max bet is $200 per spin. Wins on Secrets of Atlantis pay both left to right and right to left. This effectively doubles your chances of winning on every spin. The Mermaid symbol is wild for all symbols and takes up four symbol positions on each reel. If part of the Mermaid wild is displayed on one symbol position the Wild Nudge feature is activated and the wild nudges up or down to cover the whole reel. 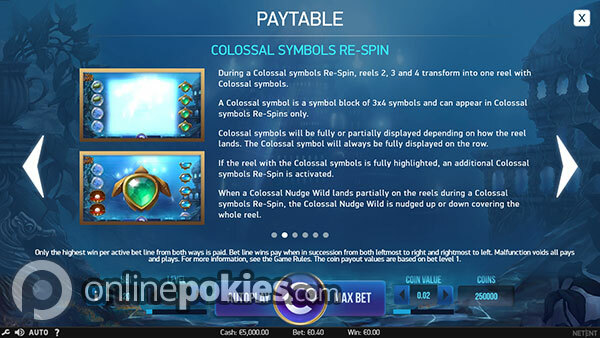 To trigger the Colossal Re-Spin feature you need all three or the middle reels to be highlighted. The highlights appear randomly and can trigger the feature at any time. Once triggered the middle three reels become one and Colossal symbols appear on the reel. 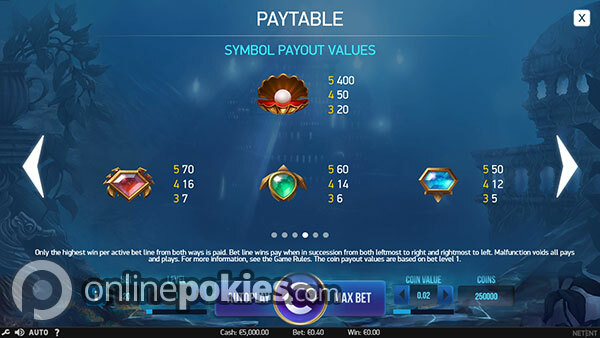 This gives you the chance at getting huge multi-line wins and even a full screen of the same symbol. 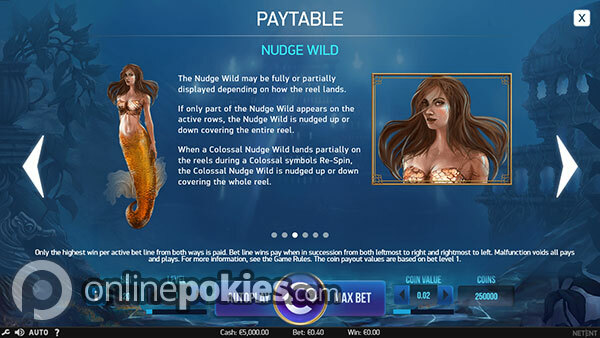 If part of a wild Mermaid appears on the Colossal reel the nudge feature will activate. Addition re-spins can be won if the middle reels highlight during a re-spin.